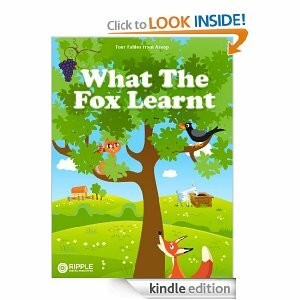 Book Description from Amazon: Four fox tales from Aesop’s fables presented with modern illustrations: The Fox and the Crow, The Fox and the Goat, The Fox and the Grapes and The Fox and the Cat. These are short stories that are fun and easy to read. Each story is summarized with a moral that you might have even heard of. Mary’s Review: These are four short tales of a fox who seems to have an angle up his paw at all times. Each tale has a moral value at the end. Although I think they are a little difficult for a small child to understand, with some explaination they would understand. The illustrations are colorful and keep the child’s attention. I would recommend this book for older children 6-12. About The Author: Aesop, or Æsop (c.6th. century BC), legendary Greek source of over 600 fables including The Tortoise and the Hare, written from the oral, have been translated into English by many including the Rev. George Fyler Townsend (1814-1900) and Ambrose Bierce (1842-1914). Through the use of (mostly) animal protagonists, Aesop’s fables consist of simple tales with moral endings transcending time and place so to be as relevant today as they were millennia ago. Universally popular, they still inspire many contemporary stories, plays, and movies.